Stated simply, strategy is a road map or guide by which an organization moves from a current state of affairs to a future desired state. It is not only a template by which daily decisions are made, but also a tool with which long-range future plans and courses of action are constructed. Strategy allows a company to position itself effectively within its environment to reach its maximum potential, while constantly monitoring that environment for changes that can affect it so as to make changes in its strategic plan accordingly. In short, strategy defines where you are, where you are going, and how you are going to get there. Strategic planning, as a formalized business process, has been in practice for almost 40 years. However, it is commonplace to find that a grand majority of organizations have no clear concept of how to effectively conduct the planning process. As a result, most strategic plans are poorly conceived and do nothing more than sit on a bookshelf; no real impact is ever made on the company and its activities. Fortunately, within the past decade or so, there have been attempts made to clarify the major components and processes of strategic planning. In this respect, it has become easier for ordinary an organization to effectively create and implement a first rate strategic plan. Basic strategic planning is comprised of several components that build upon the previous piece of the plan, and operates much like a flow chart. However, prior to embarking on this process, it is important to consider the players involved. There must be a commitment from the highest office in the organizational hierarchy. Without buy-in from the head of a company, it is unlikely that other members will be supportive in the planning and eventual implementation process, thereby dooming the plan before it ever takes shape. Commitment and support of the strategic-planning initiative must spread from the president and/or CEO all the way down through the ranks to the line worker on the factory floor. Just as importantly, the strategic-planning team should be composed of top-level managers who are capable of representing the interests, concerns, and opinions of all members of the organization. As well, organizational theory dictates that there should be no more than twelve members of the team. This allows group dynamics to function at their optimal level. The components of the strategic-planning process read much like a laundry list, with one exception: each piece of the process must be kept in its sequential order since each part builds upon the previous one. This is where the similarity to a flow chart is most evident, as can be seen in the following illustration. The only exceptions to this are environmental scanning and continuous implementation, which are continuous processes throughout. 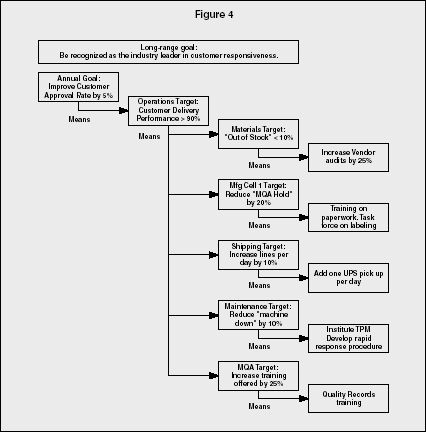 This article will now focus on the discussion of each component of the formulation process: environmental scanning, continuous implementation, values assessment, vision and mission formulation, strategy design, performance audit analysis, gap analysis, action-plan development, contingency planning, and final implementation. After that, this article will discuss a Japanese variation to Strategy Formulation, Hoshin Planning, which has become very popular. and external stimuli so as to keep pace with the competition. The idea behind this continual process is that each step of the planning process requires some degree of implementation before the next stage can begin. This naturally dictates that all implementation cannot be postponed until completion of the plan, but must be initiated along the way. Implementation procedures specific to each phase of planning must be completed during that phase in order for the next stage to be started. All business decisions are fundamentally based on some set of values, whether they are personal or organizational values. The implication here is that since the strategic plan is to be used as a guide for daily decision making, the plan itself should be aligned with those personal and organizational values. To delve even further, a values assessment should include an in-depth analysis of several elements: personal values, organizational values, operating philosophy, organization culture, and stakeholders. This allows the planning team to take a macro look at the organization and how it functions as a whole. Strategic planning that does not integrate a values assessment into the process is sure to encounter severe implementation and functionality problems if not outright failure. Briefly put, form follows function; the form of the strategic plan must follow the functionality of the organization, which is a direct result of organizational values and culture. If any party feels that his or her values have been neglected, he or she will not adopt the plan into daily work procedures and the benefits will not be obtained. This step of the planning process is critical in that is serves as the foundation upon which the remainder of the plan is built. A vision is a statement that identifies where an organization wants to be at some point in the future. It functions to provide a company with directionality, stress management, justification and quantification of resources, enhancement of professional growth, motivation, standards, and succession planning. Porrus and Collins (1996) point out that a well-conceived vision consists of two major components: a core ideology and the envisioned future. A core ideology is the enduring character of an organization; it provides the glue that holds an organization together. It itself is composed of core values and a core purpose. The core purpose is the organization's entire reason for being. The envisioned future involves a conception of the organization at a specified future date inclusive of its aspirations and ambitions. It includes the BHAG (big, hairy, audacious goal), which a company typically reaches only 50 to 70 percent of the time. This envisioned future gives vividly describes specific goals for the organization to reach. The strategic results of a well formulated vision include the survival of the organization, the focus on productive effort, vitality through the alignment of the individual employees and the organization as a whole, and, finally, success. Once an agreed-upon vision is implemented, it is time to move on to the creation of a mission statement. "The mission of the American Red Cross is to improve the quality of human life; to enhance self-reliance and concern for others; and to help people avoid, prepare for, and cope with emergencies." Other functions of a mission statement include setting the bounds for development of company philosophy, values, aspirations, and priorities (policy); establishing a positive public image; justifying business operations; and providing a corporate identity for internal and external stakeholders. This section of strategy formulation involves the preliminary layout of the detailed paths by which the company plans to fulfill its mission and vision. This step involves four major elements: identification of the major lines of business (LOBs), establishment of critical success indicators (CSIs), identification of strategic thrusts to pursue, and the determination of the necessary culture. A line of business is an activity that produces either dramatically different products or services or that are geared towards very different markets. When considering the addition of a new line of business, it should be based on existing core competencies of the organization, its potential contribution to the bottom line, and its fit with the firm's value system. The establishment of critical success factors must be completed for the organization as a whole as well as for each line of business. A critical success indicator is a gauge by which to measure the progress toward achieving the company's mission. In order to serve as a motivational tool, critical success indicators must be accompanied by a target year (i.e. 1999, 1999–2002, etc.). This also allows for easy tracking of the indicated targets. These indicators are typically a mixture of financial figures and ratios (i.e. return on investment, return on equity, profit margins, etc.) and softer indicators such as customer loyalty, employee retention/turnover, and so on. Strategic thrusts are the most well-known methods for accomplishing the mission of an organization. Generally speaking, there are a handful of commonly used strategic thrusts, which have been so aptly named grand strategies. They include the concentration on existing products or services; market/product development; concentration on innovation/technology; vertical/horizontal integration; the development of joint ventures; diversification; retrenchment/turnaround (usually through cost reduction); and divestment/liquidation (known as the final solution). Finally, in designing strategy, it is necessary to determine the necessary culture with which to support the achievement of the lines of business, critical success indicators, and strategic thrusts. Harrison and Stokes (1992) defined four major types of organizational cultures: power orientation, role orientation, achievement orientation, and support orientation. Power orientation is based on the inequality of access to resources, and leadership is based on strength from those individuals who control the organization from the top. Role orientation carefully defines the roles and duties of each member of the organization; it is a bureaucracy. The achievement orientation aligns people with a common vision or purpose. It uses the mission to attract and release the personal energy of organizational members in the pursuit of common goals. With a support orientation, the organizational climate is based on mutual trust between the individual and the organization. More emphasis is placed on people being valued more as human beings rather than employees. Typically an organization will choose some mixture of these or other predefined culture roles that it feels is suitable in helping it to achieve is mission and the other components of strategy design. in-depth look at the company's internal strengths and weaknesses and its external opportunities and threats. This is commonly called a SWOT analysis. Developing a clear understanding of resource strengths and weaknesses, an organization's best opportunities, and its external threats allows the planning team to draw conclusions about how to best allocate resources in light of the firm's internal and external situation. This also produces strategic thinking about how to best strengthen the organization's resource base for the future. Looking internally, there are several key areas that must be analyzed and addressed. This includes identifying the status of each existing line of business and unused resources for prospective additions; identifying the status of current tracking systems; defining the organization's strategic profile; listing the available resources for implementing the strategic thrusts that have been selected for achieving the newly defined mission; and an examining the current organizational culture. The external investigation should look closely at competitors, suppliers, markets and customers, economic trends, labor-market conditions, and governmental regulations. In conducting this query, the information gained and used must reflect a current state of affairs as well as directions for the future. The result of a performance audit should be the establishment of a performance gap, that is, the resultant gap between the current performance of the organization in relation to its performance targets. To close this gap, the planning team must conduct what is known as a gap analysis, the next step in the strategic planning process. and the desired future state. The first question that must be addressed is whether or not the gap can feasibly be closed. If so, there are two simple questions to answer: "What are we doing now that we need to stop doing?" and "What do we need to do that we are not doing?" In answering these questions and reallocating resources from activities to be ceased to activities to be started, the performance gap is closed. If there is doubt that the initial gap cannot be closed, then the feasibility of the desired future state must be reassessed. This phase of planning ties everything together. First, an action plan must be developed for each line of business, both existing and proposed. It is here that the goals and objectives for the organization are developed. Goals are statements of desired future end-states. They are derived from the vision and mission statements and are consistent with organizational culture, ethics, and the law. Goals are action oriented, measurable, standard setting, and time bounded. In strategic planning, it is essential to concentrate on only two or three goals rather than a great many. The idea is that a planning team can do a better job on a few rather than on many. There should never be more than seven goals. Ideally, the team should set one, well-defined goal for each line of business. Writing goals statements is often a tricky task. By following an easy-to-use formula, goals will include all vital components. Objectives are near-term goals that link each long-term goal with functional areas, such as operations, human resources, finance, etc., and to key processes such as information, leadership, etc. Specifically, each objective statement must indicate what is to be done, what will be measured, the expected standards for the measure, and a time frame less than one year (usually tied to the budget cycle). Objectives are dynamic in that they can and do change if the measurements indicate that progress toward the accomplishment of the goal at hand is deficient in any manner. Simply, objectives spell out the step-by-step sequences of actions necessary to achieve the related goals. With a thorough understanding of how these particular elements fit and work together, an action plan is developed. If carefully and exactingly completed, it will serve as the implementation tool for each established goal and its corresponding objectives as well as a gauge for the standards of their completion. The key to contingency planning is to establish a reactionary plan for high impact events that cannot necessarily be anticipated. Contingency plans should identify a number of key indicators that will create awareness of the need to reevaluate the applicability and effectiveness of the strategy currently being followed. When a red flag is raised, there should either be a higher level of monitoring established or immediate action should be taken. Implementation of the strategic plan is the final step for putting it to work for an organization. To be successful, the strategic plan must have the support of every member of the firm. As mentioned in the beginning, this is why the top office must be involved from the beginning. A company's leader is its most influential member. Positive reception and implementation of the strategic plan into daily activities by this office greatly increases the likelihood that others will do the same. Advertising is key to successful implementation of the strategic plan. The more often employees hear about the plan, its elements, and ways to measure its success, the greater the possibility that they will undertake it as part of their daily work lives. It is especially important that employees are aware of the measurement systems and that significant achievements be rewarded and celebrated. This positive reinforcement increases support of the plan and belief in its possibilities. Development at the executive level of a long-term vision. Selection of a small number of annual targets that will move the organization toward the vision. Development of plans at all levels of the organization that will together achieve the annual targets. Regular audits of the plans. Among U.S. companies that utilize this method are Hewlett-Packard and Xerox. The literal meaning of "hoshin kanri" is helpful in understanding its use "hoshin" is made up of two characters that mean "needle" and "pointing direction," together meaning something like a compass "kanri" also is made up of two characters that mean "control" or "channeling" and "reason" or "logic." Together they mean managing the direction of the company, which is vitally important especially in times of rapid change. Hoshin management was developed in Japan as part of the overall refinement of quality programs in that country after World War II. At one time, "made in Japan" was synonymous with shoddy quality, but with the encouragement of the American occupation force, the Japanese Union of Scientists and Engineers (JUSE) made great efforts to improve Japanese manufacturing. An important element of the JUSE program between 1950 and 1960 was inviting W. Edwards Deming and Joseph M. Juran to train managers and scholars in statistical process control (SPC) and quality management. So significant were these visits, especially Deming's, that the highest Japanese award for quality is called the Deming Prize. Each company developed its own planning methodology, but the Deming Prize system involves the sharing of best practices, and common themes developed. In 1965 Bridgestone Tire published a report described the planning techniques used by Deming Prize winners, which were given the name hoshin kanri. By 1975 hoshin planning was widely accepted in Japan. In the early 1980s hoshin planning began to gain acceptance in the United States, first in companies that had divisions or subsidiaries in Japan which won the Deming Prize: Yokagawa Hewlett-Packard, Fuji Xerox, and Texas Instruments' Oita plant. Florida Power and Light, the only company outside Japan to win the Deming Prize, was an early adopter. During the 1990s the practice spread. In 1994 Noriaki Kano, professor of management science at the University of Tokyo and member of the Deming Prize Committee, gave a presentation on the topic at the meeting of the American Society of Quality Control (now the American Society for Quality). Hoshin planning should be seen in the context of total quality management (TQM). Several elements of TQM are especially important for the effectiveness of hoshin planning. Most basic is a customer-driven master plan that encapsulates the company's overall vision and direction. Hoshin planning also assumes an effective system of daily management that keeps the company moving on course, including an appropriate business structure and the use of quality tools such as SPC. A third important element of TQM is the presence of cross-functional teams. Experience in problem solving and communications across and between levels of the organization are vital for hoshin planning. A number of general principles underlie this method. Of utmost importance is participation by all managers in defining the vision for the company as well as in implementing the plans developed to reach the vision. Related to this is what the Japanese call "catchball," which means a process of lateral and vertical communication that continues until understanding and agreement is assured. Another principle is individual initiative and responsibility. Each manager sets his own monthly and yearly targets and then integrates them with others. Related to this principle is a focus on the process rather than strictly on reaching the target and a dedication to root cause analysis. A final principle that is applied in Japan-but apparently not in the United States-is that when applying hoshin planning, there is no tie to performance reviews or other personnel measures. In its simplest form, hoshin planning consists of a plan, execution, and audit. In a more elaborated form it includes a long-range plan (five to ten years), a detailed one-year plan, deployment to departments, execution, and regular diagnostic audits, including an annual audit by the CEO. The long-range vision begins with the top executive and his staff, but is modified with input from all managers. The purpose is to determine where the company wants to be at that future point in time, given its current position, its strengths and weaknesses, the voice of the customer, and other aspects of the business environment in which it operates. Beyond stating the goal, this long-range plan also identifies the steps that must be taken to reach it. It focuses on the vital few strategic gaps that must be closed over the time period being planned. Once the plan has been drafted, it is sent to all managers for their review and critique. The object is to get many perspectives on the plan. The review process also has the effect of increasing buy-in to the final plan. This process is easier in Japanese companies than in most U.S. firms because most Japanese companies have only four layers of management. Once the long-range vision is in place, the annual plan is created. The vital few areas for change that were identified in the vision are translated into steps to be taken this year. Again, this process involves lateral and vertical communication among managers. The targets are selected using criteria such as feasibility and contribution to the long-term goals. The targets are stated in simple terms with clearly measurable goals. Some companies and authors refer to such an annual target as a hoshin. Most companies set no more than three such targets, but others establish as many as eight. Not all departments are necessarily involved in every hoshin during a given year. The targets are chosen for the sake of the long-term goals, not for involvement for its own sake. Once the targets, including the basic metrics for each, are established, the plan is deployed throughout the company. This is the heart of hoshin planning. Each hoshin has some sort of measurable target. Top-level managers, having discussed it with their subordinates earlier in the process, commit to a specific contribution to that target, and then their subordinates develop their own plans to reach that contribution, including appropriate metrics. Plans are deployed to lower levels in the same way (see Figure 1). An important principle here is that those who have to implement the plan design the plan. In addition to the lower level targets, the means and resources required are determined. Catchball plays an important role here. A key element of the hoshin discipline is the horizontal and vertical alignment of the many separate plans that are developed. All ambiguities are clarified, and conflicting targets or means are negotiated. The final step in deploying the hoshin is rolling up the separate plans and targets to ensure that they are sufficient to reach the company-wide target. If not, more work is done to reconcile the difference. The best-laid plans can come to naught if they are not properly executed. In terms of TQM, the execution phase is where hoshin management hands responsibility over to daily management. The strategies identified in the plan become part of the daily operation of the company. If the process has been done properly, all employees know what has to be done at their level to reach the top-level goals and thereby move the company toward the future described in the long-term vision. Essential to hoshin planning is the periodic diagnostic audit, most often done on a monthly basis. Each manager evaluates the progress made toward his own targets, and these reports are rolled up the organization to give feedback on the process to the highest levels. Successes and failures are examined at every level, and corrective action is taken as necessary. If it becomes apparent that something is seriously amiss in the execution, because of a significant change in the situation or perhaps a mistake in the planning phase, the plan may be adjusted and the change communicated up and down the organizational structure as necessary. The audit is a diagnostic review, an opportunity for mid-course corrections and not a time for marking up a scorecard. At the end of the year, the CEO makes an annual diagnostic review of the entire plan, focusing not only on the overall success or failure, but also on the entire process, including the planning phase. The results of this audit become part of the input for the next annual plan, along with the five-to-ten-year plan and changes in the internal or external business environment. hoshin planning uncovers the vital few changes that need to be made and ties them to strategic action. It transmits the signals from top management to the rest of the organization in a form that can bring about change at every level. It is participative: the individuals that have to implement the plans have input into their design. Perhaps most importantly, it focuses on the process rather than just the result. This includes continual improvement of the hoshin planning process itself. Organizations that persist in this method over a period of a few years report great benefits from its use. Babich, Peter. Hoshin Handbook. 2nd ed. Poway, CA: Total Quality Engineering, Inc., 1996. Bechtell, Michele L. The Management Compass: Steering the Corporation Using Hoshin Planning. New York: AMACOM, 1995. ——. "Navigating Organizational Waters with Hoshin Planning." National Productivity Review, Spring 1996. Collins, Brendan, and Ernest Huge. Management by Policy: How Companies Focus Their Total Quality Efforts to Achieve Competitive Advantage. Milwaukee: ASQC Quality Press, 1993. Collins, James C., and Jerry I. Porras. "Building Your Company's Vision." Harvard Business Review, September-October 1996, 65–90. Goldstein, Leonard D., Timothy M. Nolan, and J. William Pfeiffer. Applied Strategic Planning: How to Develop a Plan that Really Works. New York: McGraw-Hill, Inc., 1993. Harrison, Roger, and Herb Stokes. Diagnosing Organizational Culture. San Francisco: Pfeiffer, 1992. King, Bob. Hoshin Planning: the Developmental Approach. Methuen, MA: GOAL/QPC, 1989. Mellum, Mara Minerva, and Casey Collett. Breakthrough Leadership: Achieving Organizational Alignment through Hoshin Planning. Chicago: American Hospital Publishers, Inc., 1995. "Total Quality Engineering." Hoshin Planning. Poway, CA: Total Quality Engineering, Inc. Available from < http://www.tqe.com/hoshin.html >. All your materials are handy useful to development professionals as well as beginners. How can we ensure child participation at Schools and at Community level? Can you suggest a framework?